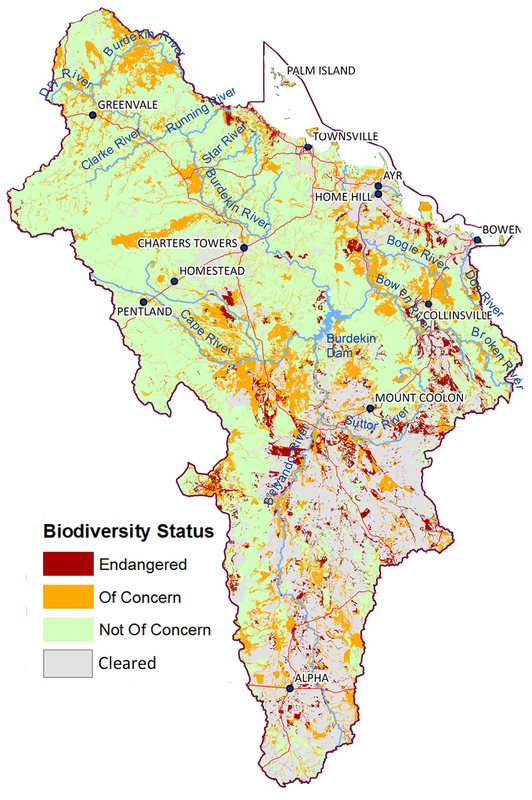 The single most significant cause of biodiversity decline is loss of habitat, particularly through the clearing, fragmentation and degradation of native vegetation. Maintaining and improving the integrity (extent, distribution, connectivity and condition) of native vegetation at landscape and catchment scales continues to be a priority for biodiversity in our region. The Burdekin catchment has been subjected to a significant level of clearing in some areas, while other areas are less affected and only show pockets of clearing. The Upper Burdekin retains greater than 90 per cent remnant vegetation, however coastal areas and large tracts of land in the Belyando and Suttor catchments have been cleared. Coastal areas are also extensively cleared, with the main native vegetation remnants being riparian and coastal wetlands and in non-arable hill country. With the exception of town centres, the majority of past clearing was undertaken for grazing and irrigated cropping. In total 25.5 per cent or 36,000 km2 of the Burdekin catchment has been cleared with the Belyando and Suttor catchments having only 50 per cent and 53 per cent respectively of vegetation cover remaining (Queensland Herbarium, 2015). reduced buffering capacity against other threatening processes.